This episode contained a whole lot of fighting (which From Dusk Till Dawn has previously used as filler because they’re not even super fight scenes) with one important incident – and by important I mean enraging. Last episode Richie was kidnapped by Amaru and taken to the mental hospital where she was locked up, the bloody words still on the wall. With a flashback we’re shown a new power of Amaru’s – the ability to turn people to their dark side and make them evil and violent: marking them with blood red eyes. Look, I like action, I do. And a well choreographed fight scene is a joy to behold (just look at any episode of Into the Badlands, that is awesome and beautiful). 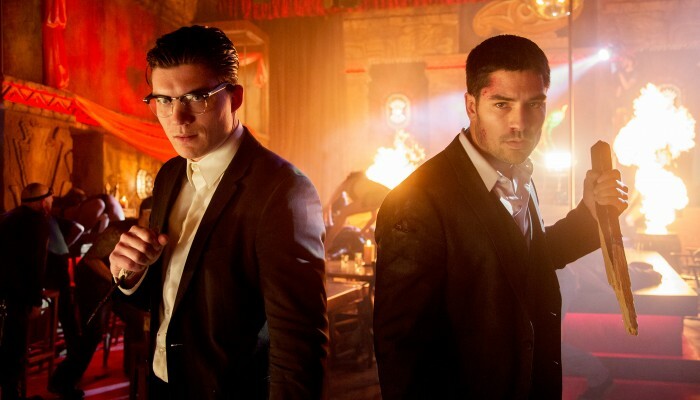 But From Dusk Till Dawn has many of the same terrible problems that we’ve seen with Vampire Diaries and Originals when it comes to supernatural power –it varies. A couple of episodes ago Burt took down Richie and Seth like they were small children because he was the eternal hunter and Just That Awesome. This episode Richie takes him down with minimal effort. Seth is human yet seems to manage better against Richie than Burt does. Scott has these amazing sword skills from nowhere. We see this a lot with From Dusk till Dawn, a character’s skill, power etc will change episode to episode at the convenience of the plot. One element that is powerful to see is Richie’s terror for his brother – both in the beginning afraid he wouldn’t find Richie and then when he sees Richie possessed. You can almost feel the flashback to the first season when Seth was so afraid that Richie was delusional and dangerous – that he was worried he was losing his brother to insanity, even as it turned out to be possession or something similar. After much fighting they eventually, with Burt’s insight, figure out how to free Richie and cleanse him with fire. Last episode I said that this show lacked meaningful female characters and Ximona was badly used and deserved to be far more than a love interest. The solution to this wasn’t to fridge her, damn it! This problem is now just so much worse because with Santanico gone there are no female characters who are likely to realistically step up on par with Ximona’s potential.